Marriage, it seemed, had ended my boating career, but it festered away for some twenty years and finally burst out again after computers, modems and, finally, the internet arrived. I managed to start doing some virtual boating, finding myself the role of creating and maintaining a web site to keep Nicholson's Guides up to date. It gradually expanded to cover much more than Nicholsons. Then, day trips to visit the acquaintances made via the internet, followed. One of the more memorable of these, on 25 October 1998, was an expedition as far as possible up the, essentially unnavigable, Soham Lode, a tributary of the Great Ouse. The trip was in support of a campaign by Town Councillor, Tony Hinsley, to return the lode to navigability. I cadged a lift from the Waterfront at Ely, along with the Mayor, press and other dignitaries, on nb Jabberwocky, Mark Zytynski's boat, transferring to nb St Kilda, Robert's Law's floating home once we had reached the entrance to the lode. In the photograph here, I'm standing behind Jean Gawlinski (with Camera) who is beside Robert, at the helm of St Kilda, while George Coulouris steers his boat, nb Gypsy Rose. 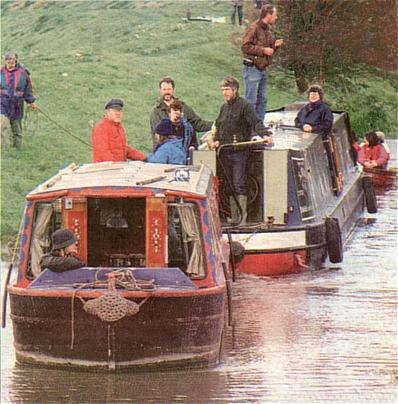 With no winding hole, it was necessary to tie stern-to-stern in this way, in order to be towed out again once the boats had got as far as they could. I made a similar trip with Steve King, the following summer, aboard his trip boat Liberty Belle. That time Steve had invited me. It was filmed by Anglia TV for their Sunday lunch-time programme "Take It On", designed to encourage people to do voluntary work. Steve and I were interviewed about the restoration of the Lode and the tourist and other benefits it would bring to the area. Unfortunately progress up the lode in summer was practically zero. Weed completely choke Liberty Belle's cooling intake and most of the film showed Steve or I hanging overboard, broom in hand, attempting to keep it clear.